Liphistiidae are a family of spiders which don't have a common name. These spiders are remarkable because they remain morphologically very similar to 290 million year old fossils from the same suborder. This means they have a very highly conservative body plan. Their venom glands are tiny and for a while biologists believed they didn't have them. They lack parts of the respiratory system which are present in all other spiders. They live in tiny tube-like borrows and make use of trapdoors like many other spiders. Over the last 300 million years they have really got the whole trapdoor technique down packed. 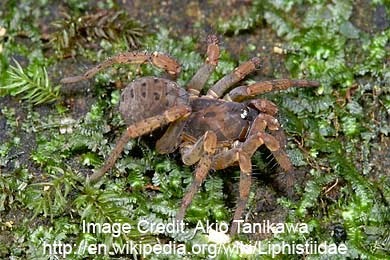 Liphistiid spiders are found in East and South East Asia. Liphistiidae have been placed in a spider suborder called Mesothelae and are the only living spiders in this group. There are 3 extinct members of this group, all of which have a fairly highly conserved morphology. This suborder is the most basal group of spiders (i.e. 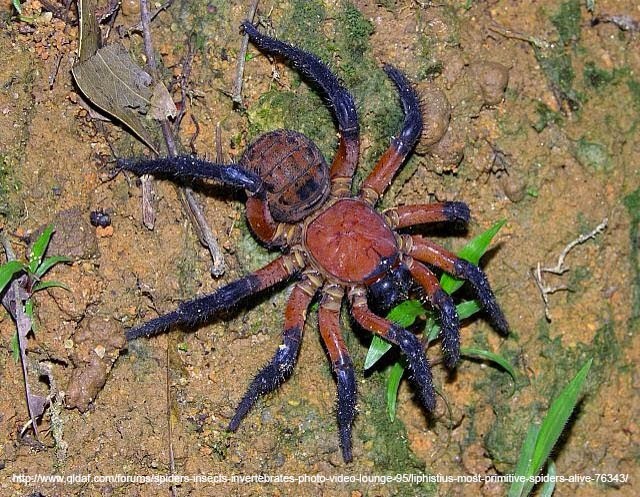 it is the most distant relative of all other species of spiders). There are 8 genera in the family.